Our programmable lawn irrigation systems make it easy to comply with municipal watering restrictions. Beautify your property at night with our professionally installed landscape lighting. Keep sidewalks and parking clear of Greater Vancouver’s wet and heavy snow. Kore is an affordable drainage company that understands the challenges of our wet environment. 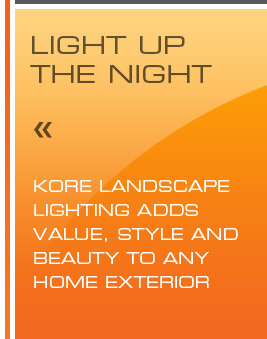 Enhance your residential or commercial property with Kore’s landscape irrigation systems and outdoor landscape lighting. Enjoy a beautiful landscape with minimal maintenance, at a competitive price. For a quote or more information about our services, call or email us.